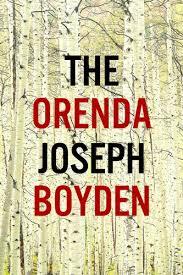 Congratulations to Joseph Boyden, the Canada Reads 2014 Winner for The Orenda! Canada Reads is an annual competition where 5 personalities defend their favorite book. The debates are broadcast on CBC, and panelists eliminate one book at a time until only one is left. The remaining title is proclaimed the best book of that particular year. The award was initially created in an effort to boost sales of Canadian titles. The first Canada Reads was awarded in 2002 to Michael Ondaatje for In the Skin of a Lion.